Here, I expose a simple solution to backup your developments in the remote directory \\YOUR_SERVER_or_EXTERNALDISK\backupWorkspaces\. 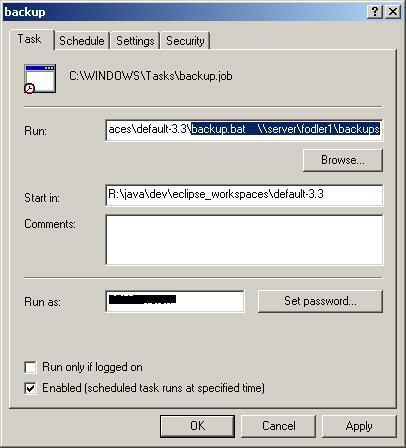 – Create a Windows scheduled task (“Scheduled Task”) that runs the daily BATCH. – This batch uses 7zip compressor to be installed in C:\Program Files\7-Zip. – You could add more resources to backup in the “backup_listfile.txt” file.